The festive season is now at an end and it is early evening on Saturday 7th January and this is our first tasting of 2012. It could not be a better tasting than going over to the fabulous Isle of Islay for this special tasting. This distillery was founded over two centuries ago in 1779, Bowmore is the first recorded distillery on Islay (pronounced ‘eye-la’) and one of the oldest in Scotland. 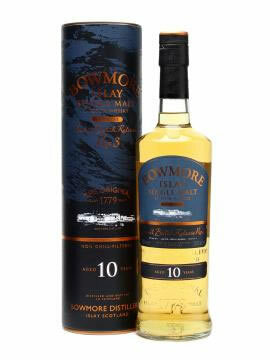 Islay Single Malts are renowned for their peaty smokiness and Bowmore is no exception. Bowmore carefully smoke their malt in a peat-fired kiln, just as their ancestors did over 200 years ago. Nose…Islay peat smoke is first on the nose followed by some Dundee marmalade, sea mist, and right at the back is a wee bit of vanilla. Taste…Drying peat, quite full bodied, spicy, oranges are still evident, a little floral but only a little, the aroma of a freshly opened Loch Gruinart oyster. Finish…Warming and long, citrus zest, and the quite peaty smoke roll’s over the palate and a touch of sweet vanilla hangs on in there. What a great start to 2012 with this fabulous Islay dram. This Islay is non chill-filtered and has been nursed for ten years in first-fill Bourbon casks. There has only been 1,850 cases released worldwide and is priced at less than £50.00 and well worth every penny. Recently i was elected as secretary of the Grangemouth Probus Club and one of my duties is to find guest speakers to come along to our Tuesday morning meetings and give a short talk / presentation to the club members. 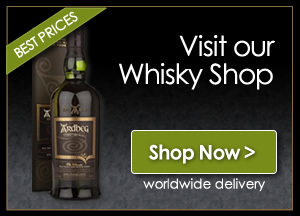 I have noted that we have not had anyone talking about our great Scottish Whisky and i was wondering if this is something that you or a fellow whisky lover could organize for us. The talks or presentations usually last for around 30 – 45 mins with a short question and answering session afterwards. We have a membership of around 48 retired members and the meetings usually average around 36. I you cannot do it personally do you know of anyone else who might be interested in coming along. I do have dates available in May onward for 2012 through to 2013. Please can you email me back or phone me on 01324 472730 for more information. Hope this makes contact Jim, talked on the phone with you on Thursday evening.